OMEGA’s Speedmaster trademark has been associated with the field of space exploration since decades. The Speedmaster Professional chronograph was the first watch to be worn on the moon, as the only watch to pass all of NASA’s stringent tests to be approved for use on manned spaceflight missions. This “Moon Watch” is still used by astronauts and cosmonauts today for extra-vehicular activity in outer space. Among one of the most advanced Speedmaster watches, the Speedmaster Professional X-33 represents the state of the art in space watches. 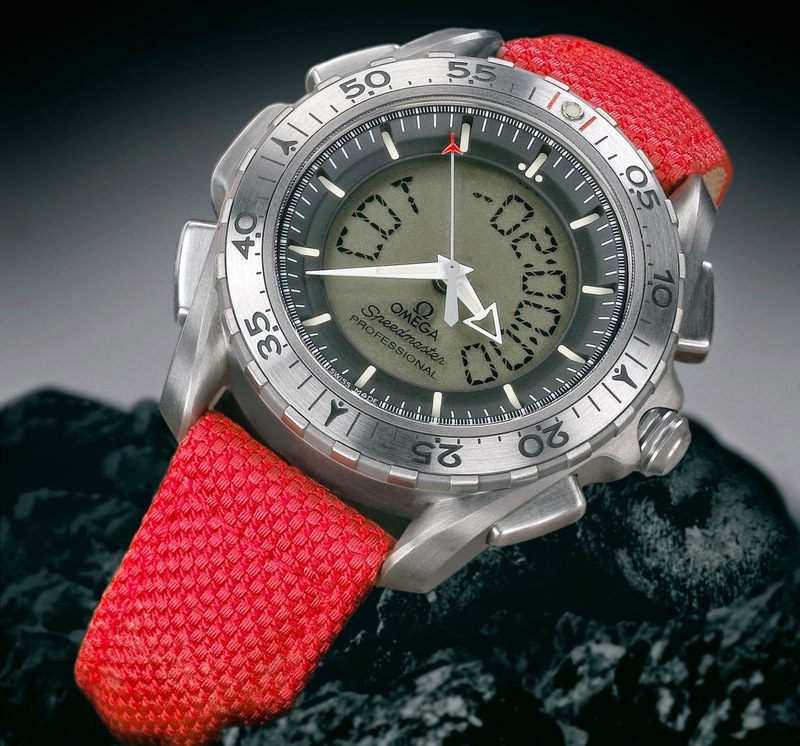 In 2002 OMEGA introduced a new version of this instrument watch that incorporates improvements based on feedback from the professionals who use the X-33 in the field. X-33 was the code name used by OMEGA watchmakers for their project of a new space watch, which saw four different prototype versions rigorously tested over five years on space missions and by the American “Blue Angels” and “Thunderbirds” pilots. The valuable experienced gained from this extensive collaborative period resulted in a watch that meets all requirements for use by professional pilots and space travellers. The X-33 has since been qualified for NASA Space Shuttle missions and chosen by the Russian Space Agency as standard equipment on all its shuttle flights, making it ex officio the watch worn on board the new International Space Station (ISS). The Speedmaster Professional X-33 is built for working in harsh environments. It has a lightweight, ultra-resistant and anti-allergenic titanium case, as well as a matching titanium bracelet or strap made out of the equally resistant and lightweight material Kevlar. The watch case is reinforced so that the watch can withstand great shocks. Perhaps the best trial of all was the X-33’s perfect performance (apart from superficial case damage) after a high impact crash on the wrist of a jet pilot evaluator (who also escaped serious injury). At the request of astronauts, the dial and display have been made as clear as possible, with luminous hour markers and hands contrasting against a black background, as well as a digital display with large, high-contrast LCD letters and numbers. • Mission Elapsed Time: a long-term chronograph function that records days, hours, minutes and seconds. This chronograph is started at the beginning of the mission and is the main reference time for all mission activities. • Mission Alarm: an alarm that can be set to sound at a given point during the mission, e.g. as a reminder to start experiments. • Universal Time: GMT, indicated as the day of the week, the hour, minutes and seconds. This is used to avoid confusion between time zones, but can also be set to a second time zone. • Universal Time Alarm: This function may be programmed at any time throughout the mission. The X-33 has a double titanium case back to ensure that the alarm function reaches a minimum of 80 decibels – essential to be heard in the interior of the Space Shuttle. The X-33 also has a digital chronograph that can be used to time any event to within 1/100th of a second, as well as a countdown timer and date display. The 2002 version of the X-33 has certain subtle changes that nevertheless make a big difference for those who use the watch professionally: new push-buttons and a new titanium crown make it easier for pilots and astronauts to operate the watch’s functions whilst wearing gloves and a new brushed steel bezel reduces glare and makes it easier to read off the display, with a luminous dot at 12 o’clock on the bi-directional bezel offering a useful point of reference for timekeeping operations using the bezel at night or in poor light. Each Speedmaster Professional X-33 is rigorously tested before shipment. It must be accurate to within 0.3 to +0.5 seconds per day, water and pressure resistant to 3 bars (ISO standard 2281) and temperature resistant from –20 to +70 degrees C. Special alarm, lighting and vacuum tests are also made on the X-33.